Located on the Hunter Street Campus, in the lovely converted Tanlaw Mill, the SU is the main social and recreational centre of the University. As well as organising lots of events and activities, the SU can help you form your own society. Take a look below at the facilities available and the varied societies that have been established by our unique mix of students. 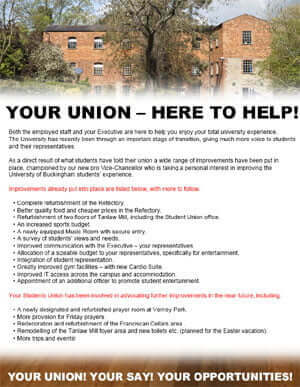 Finally, see what the SU Office can do for you when you get here. Click on the image below for more information. The main SU building, the Tanlaw Mill, is the recreational and social centre of the University. Next to The Refectory, you’ll also find The Bar. A hive of activity, day and evening, you’ll come here to meet up with friends, make new ones, dance the night away, watch a Sky TV sporting fixture, or borrow cards, dominoes or even Scrabble from behind the bar! On the Verney Park campus, you’ll find common rooms in the Students’ Union Cellars. The SU Executive Committee hold office for a period of 6 months and are elected via a secret ballot in the Spring and Autumn terms. The duty of the Committee is to uphold the Constitution of the Union, which includes the power to establish Clubs and Societies. In the past, SU Executive Committees have made donations to a variety of charities, including SOS Children’s Villages; The Medical Foundation for the care of Victims of Torture and The Red Cross. Follow the SU on . The Students’ Union Office organises events throughout the year, these include the Graduation Ball and coach trips to places of interest during the vacations. The office can also help things such as sending faxes and document /assignment binding. The Students Union is affiliated to the NUS (National Union of Students) and Buckingham students can apply for a NUS Extra card which entitles the holder to discounts on travel, entertainment, shopping and eating out etc. Click on the button below for more information (external link): Please note you may only apply for a card once you are a registered Buckingham student.